1. Mexican Food – Mexican food is completely different to what we expected, but it turns out we love almost all of it! From Tlayudas and panuchos to bean quesadillas and potato tacos plus chilaquiles and tortas (filled sandwiches – Mexico City has the biggest ones) it has been amazing to discover the food here! 2. Driving golf carts around the island of Isla Mujeres. 4. 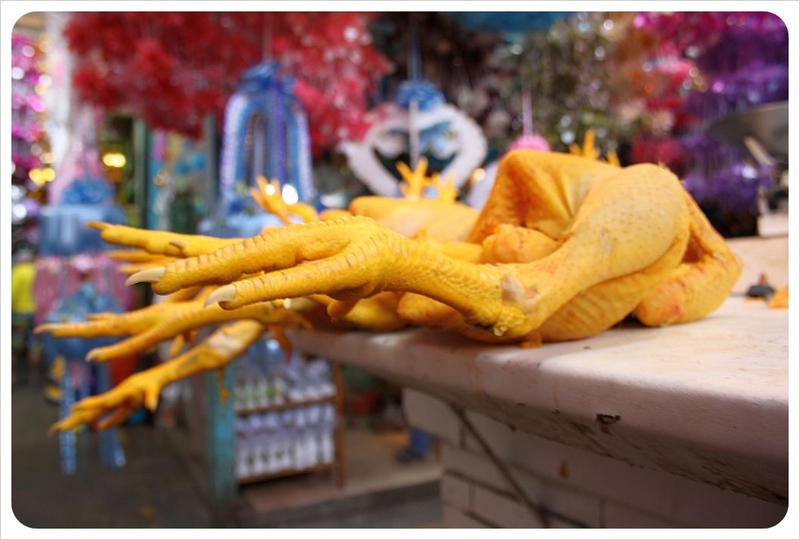 Markets – Though at times they can be shocking (squealing pigs the minute before their eventual slaughter and large yellow chicken feet spring to mind) the markets in Mexico are amazing to explore. The 20 de Noviembre market in Oaxaca was our favorite for the best selection of food (including the hundreds of mounds of deep-fried grasshoppers!) and mezcal. 5. Cenotes – considering we had never even heard of these underground waterholes, swimming in the cenotes on the Yucatan felt a bit daring and definitely refreshing. 6. Huevos motuleños – Yes, yes, we already said we loved the food, but this all day breakfast food quickly became our favorite after we discovered them during a long wait in Palenque for a bus to Merida. Huevos motuleños involve a fried tortilla topped with black beans, fried eggs, sauce and plantains, plus ham for the meat-eaters out there. Heavenly! 7. Victoria beer – There, we said it. We love Victoria beer! 8. Mexico City – It’s a magnificent mega-metropolis which requires some patience and understanding, but Mexico City is a hub of creative, forward-thinking groups and individuals with art, markets, and music everywhere you turn. Sure it has its problems, but what city doesn’t? It’s the combination of it all that makes the city so great: Posh areas like Polanco are offset by more run-down parts of the Centro Historico where culture and tradition seep into your soul. How cool to see Mariachis and Mayans catching cabs, Mexican rock bands headbang on a plaza next to a salsa club, sleek and stylish club-goers passing by happy families in the park until the wee hours and openly gay men and women walking hand in hand with their partners more often than in any U.S. city we know of. Frida and Diego (Kahlo and Rivera that is) can be found everywhere, and there are hundred of art museums, exhibitions and co-operations with institutes world wide. Mexico City is chaotic, yet quaint, crazy and creative. We miss you Mexico City! 10. 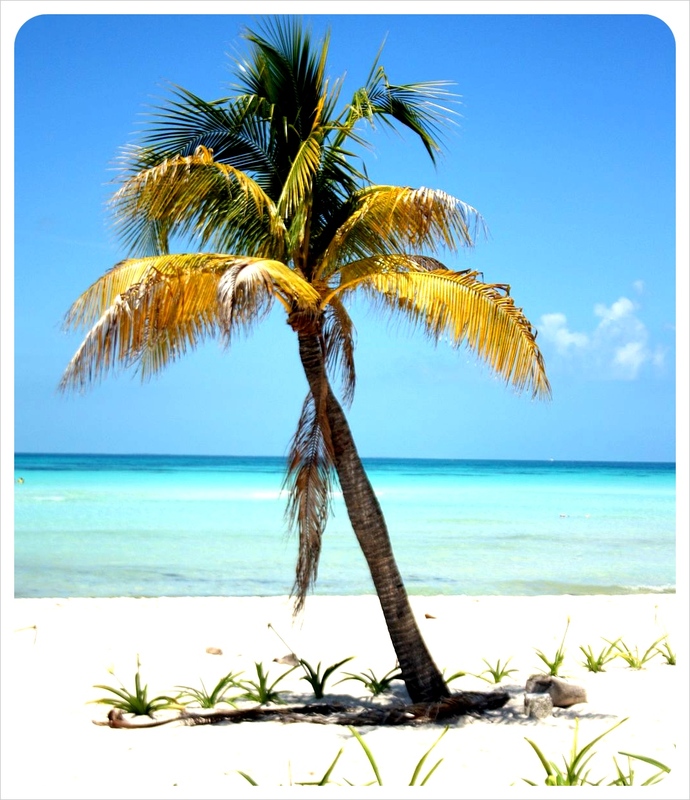 Valladolid – we fell in love with this little lazy town on the Yucatan, but we’d like you to please not go there. 11. Mariachi Bands – always fun to listen to, even if they don’t quite hit the notes. 12. Agua fresca – We might actually be able to slowly wean ourselves off Diet Coke thanks to these giant one liter drinks of water blended with fruit. We especially like Cantaloupe and Guayaba ‘aguas’. 13. Frida Kahlo’s Casa Azul – Stuffed with her art, personal belongings and pictures, it makes you feel like you really get to know her, plus the gardens are gorgeous. 14. 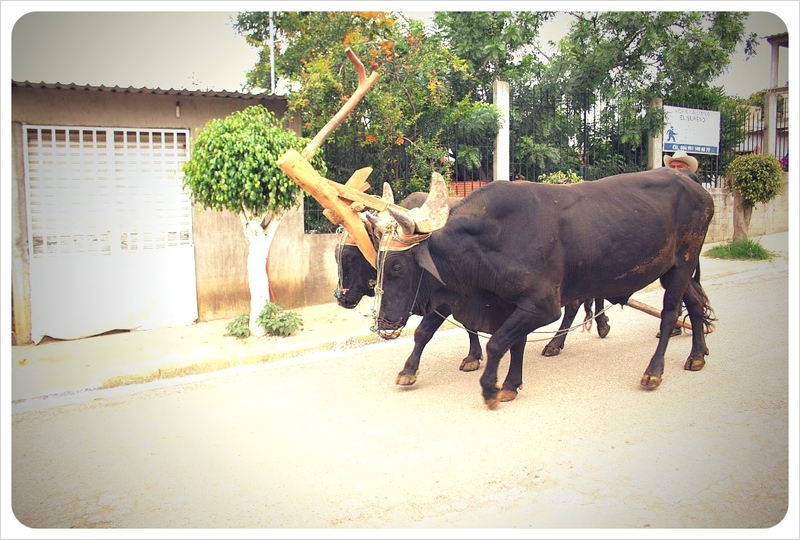 The cattle in front of our house in San Luis Beltran, Oaxaca. 15. The colorful traditional clothes worn throughout Mexico, from the many wool variations to be found in Oaxaca and San Cristobal de las Casas to the beautiful long white gowns embroidered with flowers that the woman of the Yucatan wear. Oh, and real life cowboys! Sure, we know this continues on from Guatemala down through South America, but there is also something so unifying about how even the non-indigenous men/women will wear very traditional Mexican clothing rather than identifying with global fashion. It seems like for many here, people are Mexican first, class/race/socio-economic status comes second. 16. Diego Rivera Murals in Mexico City – The murals are so insightful into Mexican history and culture, and you could spend more than a day hunting them all down throughout Mexico City. Diego’s influence as an artist was enormous here. 17. San Cristobal de las Casas – the prettiest colonial town we have seen so far. 18. The tacos from the taco vendor in Calle Uruguay – Near the bakery Pasteleria Ideal in #74 in Mexico City, you’ll see the large group of people crowded around the vendor – that’s the spot. Try an agua fresca here too – delicious. 19. Lizards galore! Mexico is filled with lizards big and small, from our pet gecko in our apartment in Playa del Carmen (and its subsequent tiny tiny little babies), to the giant iguanas in Tulum, Valladolid, Isla Mujeres and Chichen Itza. Plus we have come within a few feet of countless crocodiles, something we never thought was possible! 20. The historical ruins – The Mayan and Aztec ruins in Mexico are so majestic! We visited Teotihuacan near Mexico City, Monte Alban near Oaxaca, Palenque in Chiapas, Tulum and Chichen Itza on the Yucatan. 21. 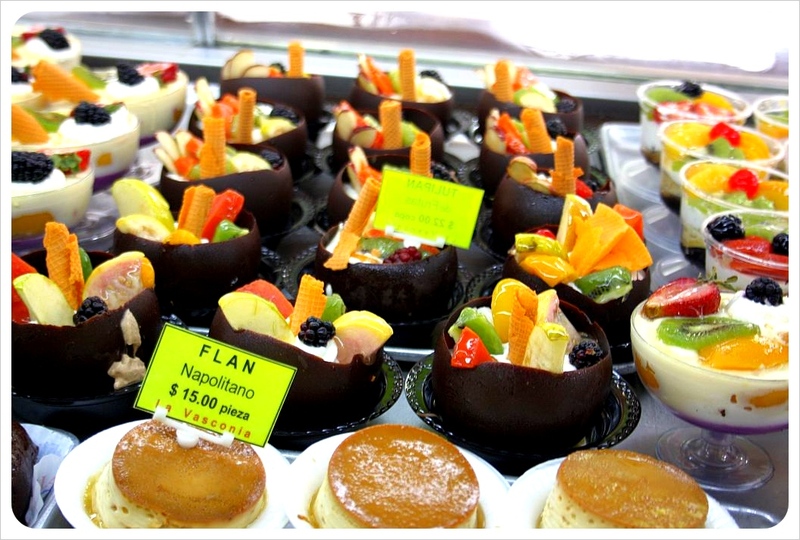 Mexican bakeries – Even just window-shopping makes our (read: Dani’s) mouths water. Cakes, fresh fruit and yogurt parfaits, cupcakes, sweet breads and freshly baked rolls are all delicious. 22. Cheladas and Micheladas –Beer mixed with tomato juice, salt, pepper and hot sauce. This is basically like a Bloody Mary but beer replaces vodka. Genius! 23. The tuk-tuks in Oaxaca. 24. Mexican buses – The buses in Mexico are top standard, reliable and clean. ADO, OCC and Oriente all provide great service, though ADO’s films and air-conditioning are good for longer trips (more expensive, though). 25. Hostal La Candelaria in Valladolid. The best hostel we stayed at in Mexico. Clean rooms, two kitchens (one outside), a gorgeous garden, and very friendly owners. Plus two of the cutest little Chihuahuas of all time. 26. Free wi-fi – In any public park or square in even the smallest city/town, at least a dozen people can be found with their laptops, not only using the free wi-fi, but also charging their computers. The parks have outlets for charging! Who needs Starbucks, when you can have free wi-fi in the park! 27. 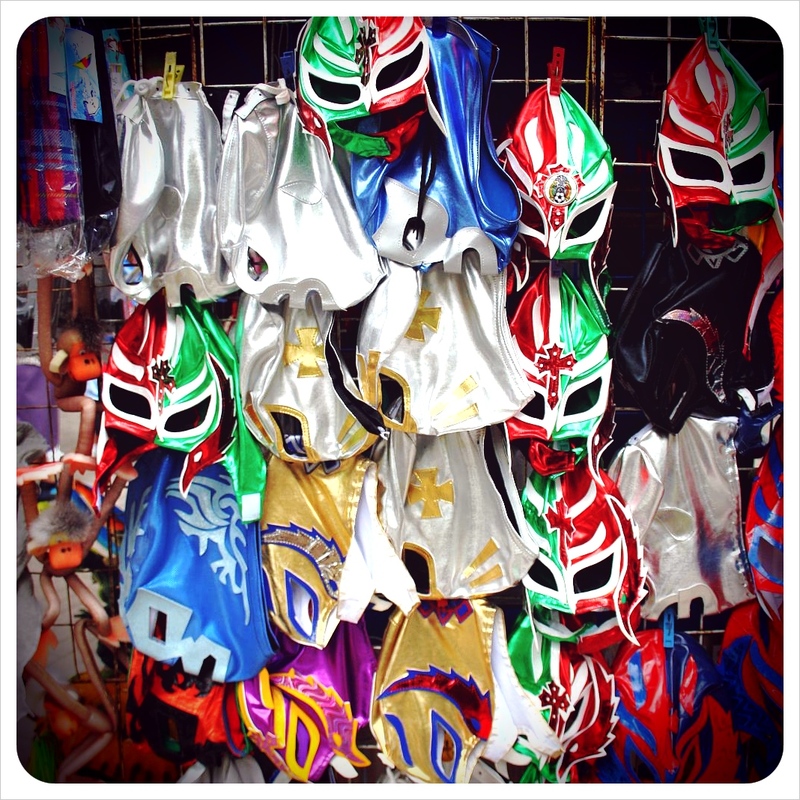 Lucha Libre – Mexican Wrestling rocks. Yes, it’s fake, but the crowd goes crazy and we loved it! 28. Policemen, on horses, preferably with sombreros. 29. Fruit in a bag, freshly cut and topped with spices & lime, for $1.00. 30. Getting our laundry professionally washed – For less than $4, a lady with a brand-new washer and dryer will scrub out stains, wash and dry your clothes and then iron them all down, flat as pancakes, leaving you with a stack of clothes a quarter of the size of the dirty, stinky ball you brought to her. 32. Meeting people from the online travel community – offline. So many bloggers come through Mexico or live here. It was especially great to meet up with Elmar and Rebecca for breakfast in Puebla (thanks to Mark from MexicoUnmasked!) and get some great insider tips , plus our tour of Cholula with Elmar, and getting to know WanderingEarl in Playa del Carmen. 33. The fact that we came to Mexico! We had so many naysayers warning us to avoid Mexico at all costs that we considered skipping Mexico altogether. For about a minute, that is, until we decided that we would rather see for ourselves the situation here than skip it. We couldn’t be more thankful for that. What are your favorite things about Mexico? Let’s reminisce together in the comments below! During our first 100 days of travel, which we spent in California, Arizona, Nevada and in Mexico, we have had some amazing ups and (luckily only very few) disappointing downs, and share with you here our tops & flop moments, experiences and recommendations below. 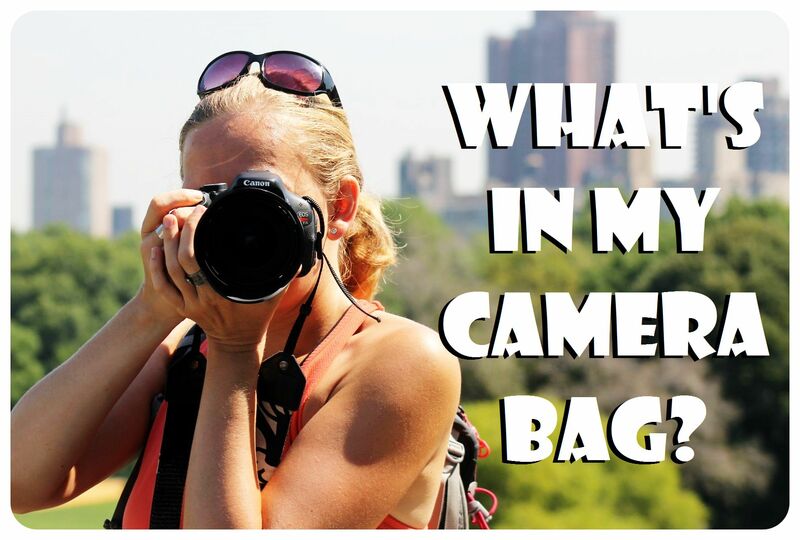 These are our own personal top travel moments. While of course we would recommend them, these were the unexpected, spontaneous experiences that make us love to travel. We caught a San Diego Padres baseball game during our one-night stop on the way to Tucson. We had nachos and cheered and soaked up the all-American experience, while discovering a city we both would visit again. We love it! Bah Humbug to anyone who doesn’t try the street food in Mexico. Sure, we eat it partially because we are on a budget, but the street food is the truly typical food in Mexico. It varies by region and is the perfect way to immerse yourself. We took our little Chevy Aveo rental car and headed south on the Pacific Coast Highway from Santa Monica to Laguna Beach early in the morning, stopping for coffee in Huntington Beach. As we laid on the beach on a still-chilly Monday morning in May, this was the first moment where we realized how free we are on this trip. We can go anywhere we want to at any time, there are no rules. We had read about Plaza Garibaldi, the square in Mexico City which is famous for its mariachi gatherings, and sure enough, we found ourselves surrounded by the hundreds of Mariachis in dozens of different bands sprawled out along the Plaza, playing songs for couples and families there on a Saturday night. After hanging out for a little while, we were about to leave, but our hungry eyes scanned the plaza for food. Through a door we discovered an entire indoor market area lined with over 15 restaurants. We chose one, sat down, and easily had some of the best food we’ve had so far on the trip. After passing through the commercial and very touristy main street in Sedona, we drove down to Oak Creek, which was originally for Dani to get some great pictures of Oak Creek Canyon. At the spot, we found families and locals hanging out along the river, hunting for crayfish or riding on inner-tubes down the natural lazy river. This was the truly beautiful Sedona we will always save in our memory. A strange mix of WWF/WWE wrestling and the bad acting of the Jerry Springer show, Lucha Libre is nothing but entertaining. They LOVE Lucha Libre here in Mexico, and it is in fact listed as second only to football (soccer) as the nation’s favorite past-time. Sure, the masks and the faker-than-fake fight action is entertaining, but it is the chaos in the stands that make Lucha Libre worth it. Fans take sides and bring drums and horns and taunt the opposing fan-side, while vendors sell Pepsi and plates of freshly breaded fish complete with lime and salsa on the side. Children and adults alike rush the stage (okay, officially it’s still a ring) for autographs before and sometimes during the fight, and afterwards they chase down the wrestlers on their way out for pictures and more autographs. These near-rockstars comply with almost every request, and are, despite their hulky size and obviously aggressive nature, more approachable than any other group of celebrities. A night to remember for sure. The worst moments were going to be both the breakfast and the see-through shared showers in the courtyard (free p*rn for the male employees walking extra slowly past the door and travelers who were having their breakfast not five feet away from it) at the Casa de Don Pablo hostel in Oaxaca. This was the worst accommodation we had had, until our 99th night when we ended up at a hostel by the name of Colibri in the beach town of Mazunte. Our room had puddles of water on the floor and it might have been months since someone had last stayed in the room. The ’en-suite’ bathroom was created by knocking some of the cement brick out of the wall and installing a toilet which flushes only when you pour a bucket of water into it and came with brown ‘marks’ on the seat. For those without the luxury of a private room (*sarcasm*), there was a shared shower located outside in the main walkway to the beach which did not even have a curtain. Turns out the place was abandoned and taken over by a self-described ‘Pinche Gringo’ (f!cking Am!rican) three months ago. A quarter of a year later, the place is still falling apart, and the room was by far the worst we have seen so far. For travelers who are on a really tight budget, the dorms are only $5 (U.S.) a night and the terrace really does have amazing beach views. Dani lost an SD Card which contained over 600 pictures of our fabulous week in Los Angeles, including the beach trips, the Griffith observatory and an MTV show being filmed at Venice Beach, BEFORE uploading them on the computer. Lesson – upload pictures onto the computer immediately and store your SD cards somewhere much safer than a jacket pocket. Weary after a day of exploring San Francisco, Dani happened to leave her dSLR camera on the seat at a diner after dinner. Miraculously, after realizing the camera was gone and sprinting back to said diner, the camera sat right on the seat where she left it. Crisis luckily averted and lesson learned: Check constantly that you have everything with you. Dani: Quesadilla de flor de calabaza from everywhere, but specifically inside the Mercado de Abastos in Oaxaca and also Agua de Guayaba (guava fruit blended with water). Jess: Potato Taco in Calle Uruguay in Mexico City and the Quesadilla from the first of many indoor stall/restaurants on De la 5 Poniente road in Puebla. Not so great for Jess is the Quesillo (traditional cheese of Oaxaca), while Dani does not like mole or Tamales. We both agree that in spite of having visited some amazing places, the city by the Bay is hands-down our favorite place – from the Mission District to the Castro, up the hills on the cable car and down to waterfront and up and over the Golden Gate Bridge. The problem is that in order to visit Canyon de Chelly you have to not only come through Chinle, but most likely you are going to spend at least one night here. There are three hotels. Book one before you get there to get a good deal. Chinle is a very run down, poor small town on the edge of Canyon de Chelly. You won’t find any restaurants outside the hotels except for a Burger King and a Subway. Located on a Navajo Indian Reservation in Northern Arizona, Canyon de Chelly (pronounced Canyon de ‘shay’) is a stunning canyon which can be visited by stopping at various overlooks on two drives along the northern and southern rims. There is no entry fee to the canyon. Half and full-day jeep tours drive along the bottom of the dry canyon (fees vary) and there is one spot where a 1.5 mile path leads from a look-out point on the north rim across to an ancient Anasazi village built into the canyon wall on the south side. This is the only unguided walk allowed and is also free. The Hoover Dam is an important structure, and Las Vegas and much of the West could not exist without it. But that doesn’t mean you have to drive there, if you ask us. 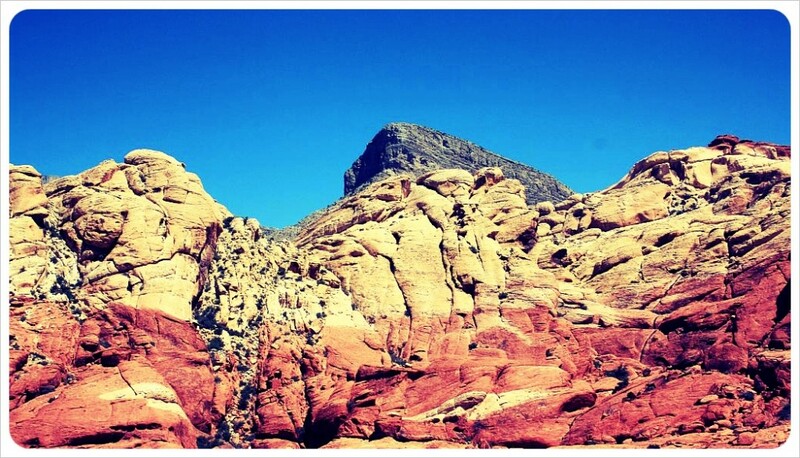 Look it up online if you want to see pictures and then head to Red Rock Canyon just outside of Las Vegas. Yes, the rocks are red, and they are gorgeous, and the 13-mile Scenic Route Drive ($7 per car) is dotted with amazing rock formations, thrilling colors and demands immediate respect for the rich variety of the landscape of the Southwest. As Mexico City’s urban sprawl connects otherwise unrelated towns throughout the Valley of Mexico, the area of Xochimilco is now the last stop on the ‘Tren Ligera’, or Light Railway, which leaves from Tasquena, itself the last stop on Line 2 of the subway. After an easy hour’s trip, make your way to one of the 7 embarcaderos for a ride on the colorful Trajinera along the canals of the former Lake Xochimilco. Bring as many friends as you can fit on the boat, along with some rum for a do-it-yourself booze cruises as the Mexicans do, or just enjoy the scenic and Mariachi-filled three-hour ride along the canal. Whether you are one of our fellow round-the-world travelers or just looking for an original vacation option, you should seriously consider doing a housesit. Sign up with Housecarers.com or Mindmyhouse.com where homeowners post ads to watch their house for anywhere from a week to over a year. The stay is free in exchange for taking care of the house and (almost always) a housepet or even farm animal while they are gone. We have done two housesits now, and especially the three weeks in Tucson, Arizona were some of the best times of our trip. We stayed (rent free) in a great house with a pool, took care of a lovely dog, and got to know a city we never would have visited on our own. We learned about the pattern of daily life in the desert (up at 5:30 and get everything done before 1pm, when temperatures soar up to 108 degrees Fahrenheit – 43 Celcius). 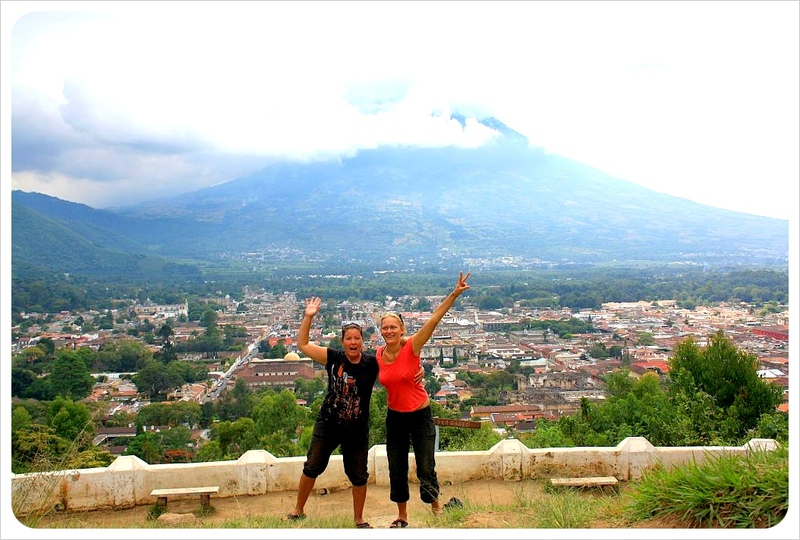 We’re on the look-out for our next housesit somewhere in Central America in the coming months and can’t wait! Cruising down the PCH (that’s the Pacific Coast Highway in in-the-know lingo) from L.A. to Laguna Beach is exactly the trip you expect it to be. The sun, sand and surfers are just like out of a movie. In fact, on our trip down the coast on Monday, we even saw a film crew on location. Read on for the Globetrottergirls top 5 stops along this stretch of the PCH. Santa Monica beach and pier are pure California, and though right off Interstate 10 not 30 minutes from West Hollywood and the Sunset Strip, the town center runs at such a slow pace you forget how close you are to the celebrity-centric metropolis of L.A. Shuffle down Main Street and you’ll pass dozens of restaurants and bars, from chic to mom-n-pop, and hundreds of relaxed locals taking in good wine, good food, and plenty of California sun along all the year-round outdoor seating. Though we didn’t stop to nibble here, Holy Guacamole, It’s All Good Bakery, Novel Café and Dhaba Cuisine of India all caught my eye. Make sure to park at the pier and take a walk out onto this classic American pier. Sure, it’s family-friendly with it’s ferris wheel, easy roller coaster, funnel cakes and coffees and popcorn, but combined with the amateur fishermen at the end of the pier, the seals, the cheap margaritas at the Mexican restaurant and the fact that the it’s open til 10pm, the pier is well worth a visit for everyone. Even if you can’t catch fish, everyone can catch an amazing golden sunset over the hills. Parking in the main lot at the pier is $10 at an all-day flat rate, or the nearby lots run at only $1 an hour. Well worth it! Just a ten minute drive down the PCH is Venice Beach, the punk/cool older brother version of comparably quaint Santa Monica. 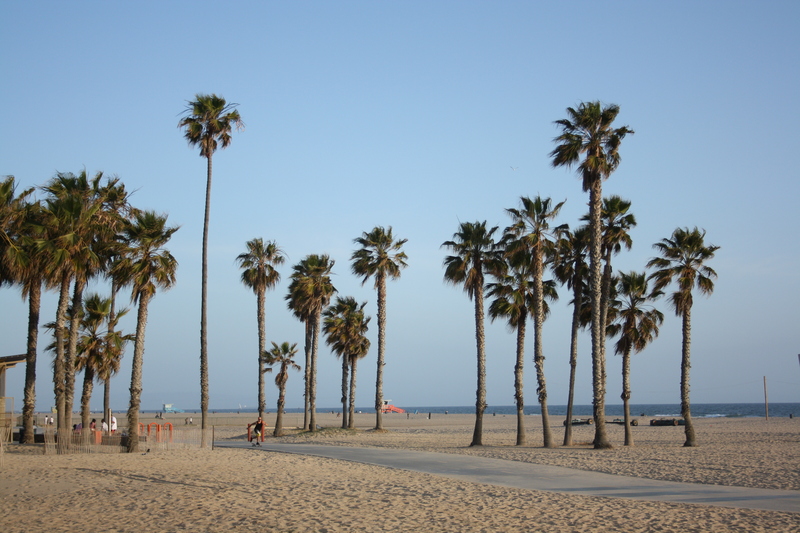 Home to the famed hard-core Muscle Beach, Venice Beach is also piled up with bars and restaurants and a slightly grungy block of market stalls selling everything from t-shirts and ‘hand-blown glass’ (bongs) to sunglasses, key cutting, donuts and useless but cool knick knacks. The beach here is filled with character (and characters!) and the views out into the water are breathtaking. The morning of our visit there were at least 20 surfers out catching waves, as well as a film crew at Venice Beach, though we don’t know whether it was a movie or a commercial. Passing through the mega-port city of Long Beach which has it’s own charms (the Queen Mary, trips out to Catalina Island and the shops at the Ports of Call), Seal Beach is just 10 minutes down the highway on a slight peninsula. The beach itself is simple and large, plenty of room to grab a spot and a tan and the pier is plain, though surprisingly open til midnight. You do peek out at a few oil rigs offshore and of course the port is up the coast to your right, but easily ignorable. What makes Seal Beach so great is it’s Main Street. Galleries, restaurants, diners, ice-cream parlours, cafes and benches outside several shops for a chance to just sit and relax as you make your way from friendly shop owner to friendly shop owner. We were both immediately transported to the 50s or 60s (or how we imagine that era to have been) and felt completely relaxed. We picked up some duh-lishious bakery goodies at Sweet Jill’s and ate some excellent pizza at Z Pizza, taking advantage of a lunch special they had – $7 for 3 slices of pizza and a drink. Bargains can taste good too! This was a must-see stop for one of us (ahem….you know who you are), as this is the location of the OC. Much larger than Seal Beach and very touristy, this does not harm Newport Beach in the slightest. In fact, this is a perfect place to hang for a longer period of time. You’ve got miles of gorgeous beach and every type of restaurant, bar and tattoo shop you can imagine. We only stopped here for a quick coffee break and some 5 o’clock sun, but I’d definitely like to go back and soak up more sun here at Newport Beach. For those of us who prefer reality to a made-up TV show, Laguna Beach was an ultimate destination for a certain fan of MTV’s reality show of the same name (ahem, guilty as charged). Laguna Beach was much larger than I expected, and very spread out. The beaches are a dream and the marina is giant and breathtaking to think about how many millions of dollars were splashed on those yachts. No celebs were spotted in the making of this post, however. 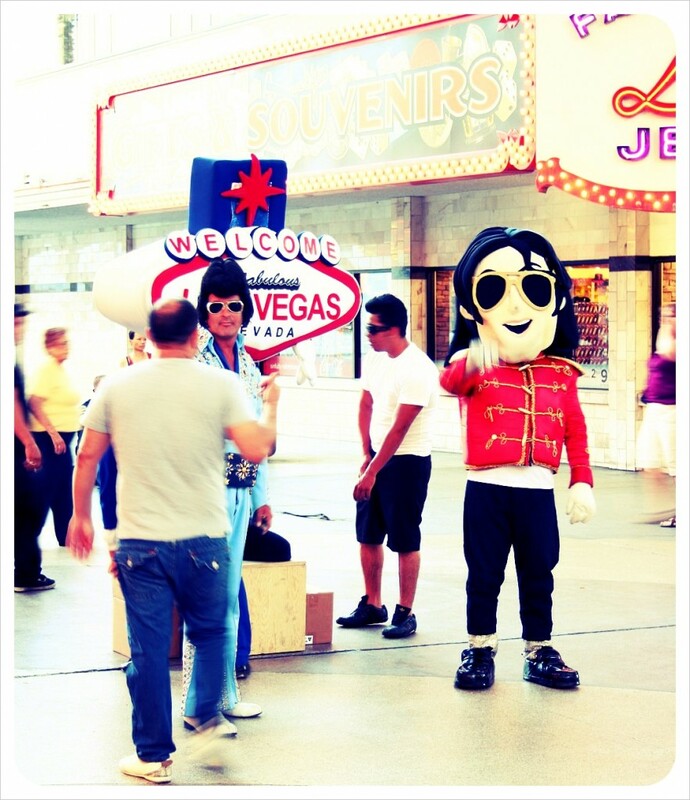 Top 10 things to do in Las Vegas: Non-Gambling & almost free! 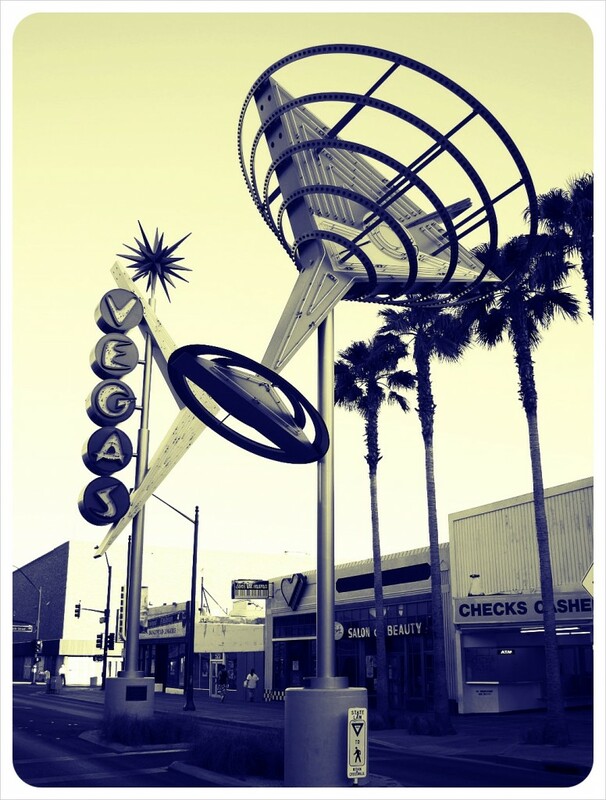 We never meant to start our globetrotting adventure in Las Vegas. Instead a series of random circumstances led us to start in Sin City, but after three and a half cold & rainy years in England, the sweltering and sunny Nevada desert seemed the perfect kick-off for our around-the-world journey. Neither of us are any good at gambling, and with no desire to lose all our savings to slots and booze, we set out to explore how to enjoy the city of Vegas beyond the sin. The 4.5 miles between the Mandalay Bay and the Stratosphere offer nearly infinite people-watching pleasure. 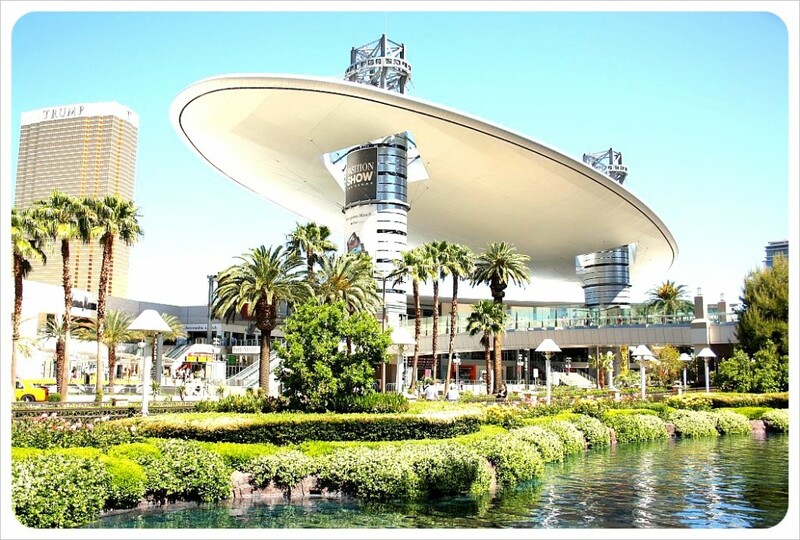 Either belly up at an outdoor bar/restaurant like the tequila and taco treasure – Planet Hollywood’s Cabo Wabo, the silly slots and parrots outside the Flamingo’s Margaritaville bar, or for an Ocean’s 11 replay, score a spot at the fountain in front of the beautiful Bellagio hotel. People-watching throughout Las Vegas, you are almost certain to see at least one, but probably more of the following: the heaviest (or even thinnest) person you’ve seen in your life, too many tattoos, people from countless countries, the most eccentric, or eclectic groups of rich or poor, lucky or un-lucky bunch of average Joes or crazy Susans and other interesting creatures than you’ve ever seen in your life. Lean back, sip your margarita and enjoy. 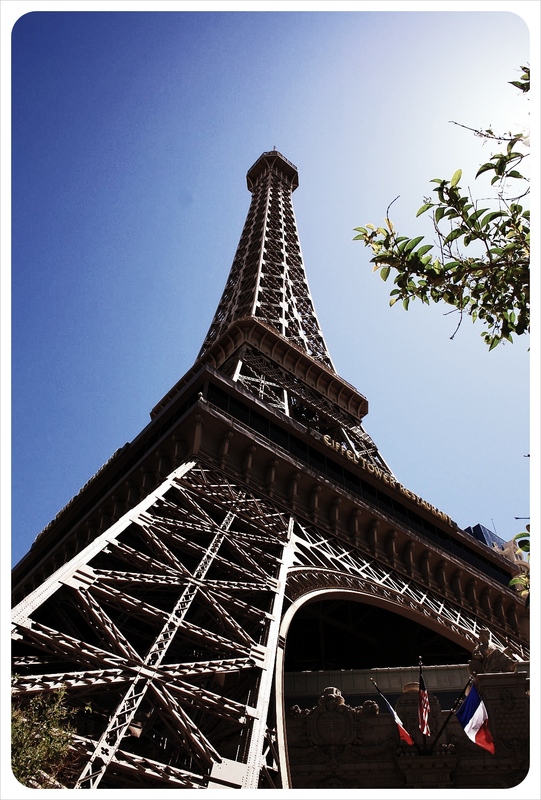 The Vegas Eiffel Tower (120m/460ft) doesn’t come anywhere near the height of the true blue Parisian version (324 m/ 1,063 ft) but it offers fantastic views over the Strip, Las Vegas and the desert beyond. Tickets are $10.50 per person – pick up one of the free Vegas brochures that are available up and down the Strip for a 2-for-1 discount. 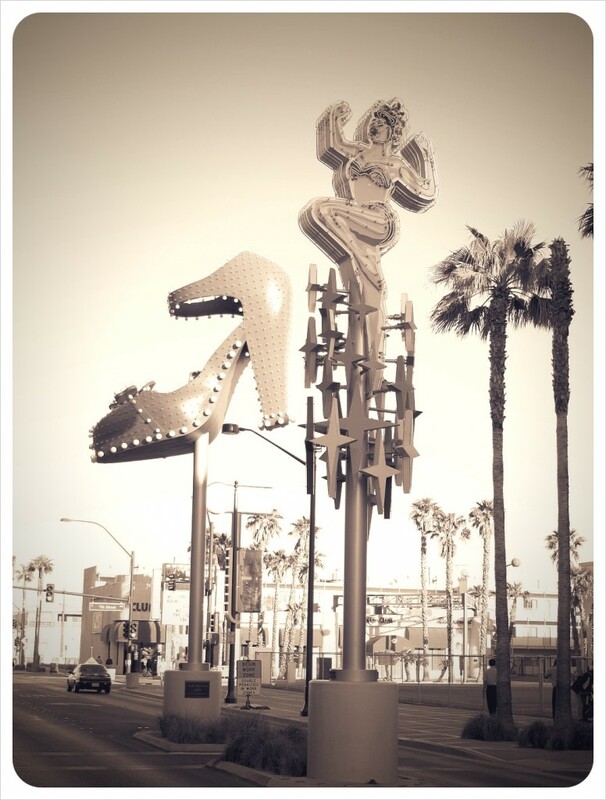 A trip to the Fremont Street Experience inspires the nostalgic, classic Las Vegas of the early 20th century before Sin City became the epitome for bigger, better, more. 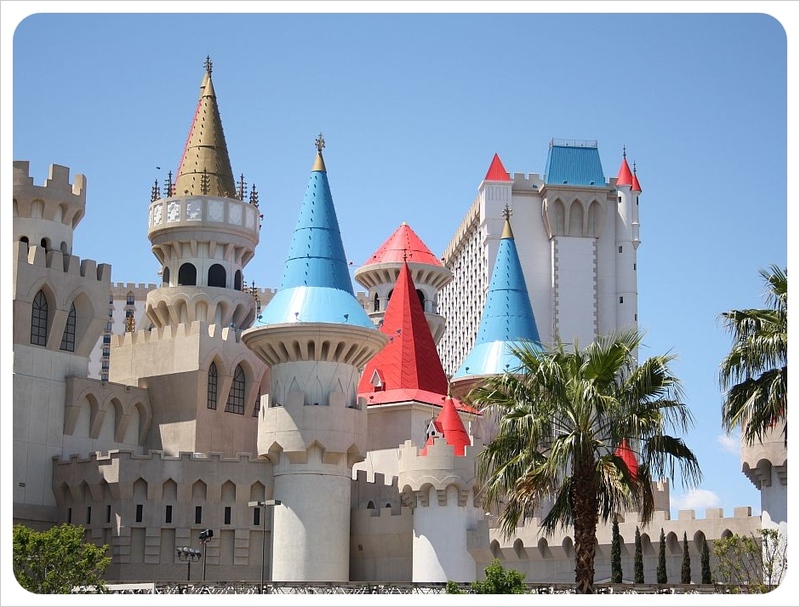 Many of the famous hotels and casinos such as the Golden Nugget are still operating and you can feel the special flair that Vegas must have had in the 1950s. In the 1990s, a roof was built over Fremont Street and area of Old Vegas was repackaged as the Fremont Street Experience in an attempt to draw visitors back after numbers sunk thanks to the explosion happening over on ‘The Strip’. We could give or take that darned roof overhead, but the casinos are more fun, there is more free entertainment, the staff is more friendly and apparently the odds are even better. Competition among the hotels on the Strip is fierce, and Las Vegas is one place where the concept of ‘Less is more’ has gone completely lost. Every hotel is an adventure in itself! 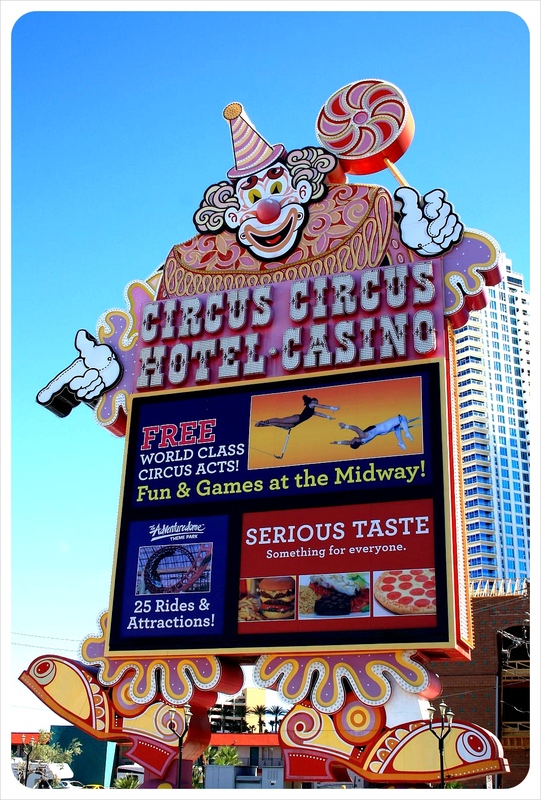 Circus Circus has a big top, New York New York has its Statue of Liberty & Brooklyn Bridge replicas and even a roller coaster. 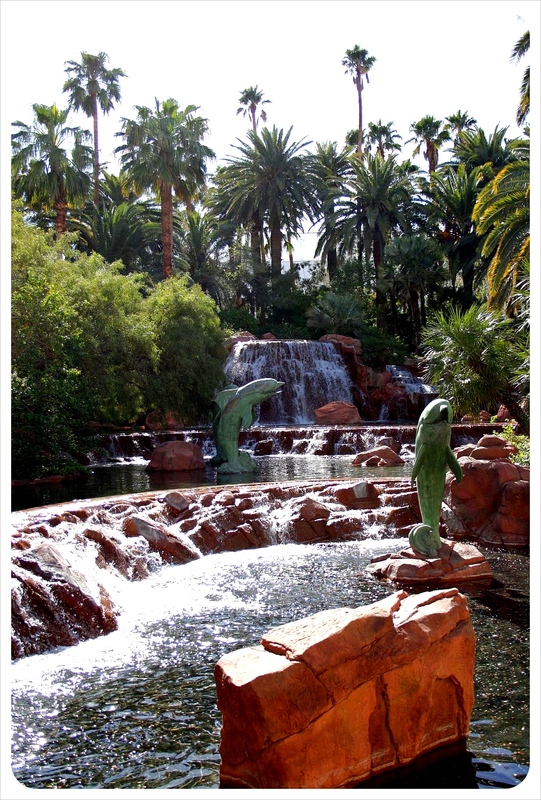 The Bellagio has its famous fountain show and Italy-inspired design, while the Mirage is home to Sigfried & Roy’s dolphin and white tiger garden and not to mention daily volcano eruptions. 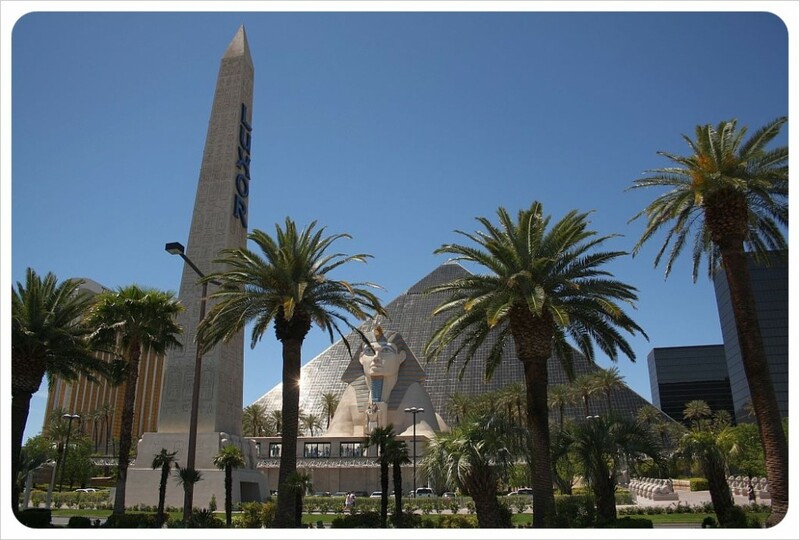 In Vegas you can walk by the Egyptian pyramids at Luxor, a near exact replica of Venice at the Venetian with its lake and gondolas, the aforementioned famed French tower at the Paris hotel and casino, a replica of the Colosseum at Caesar’s Palace, a pirate battleship at Treasure Island and and and… who knows what they will come up with next. Three extreme rides on top of the 350m (1,149 feet) tower – Insanity, which dangles you over the edge of the tower, Big Shot and X-Scream. 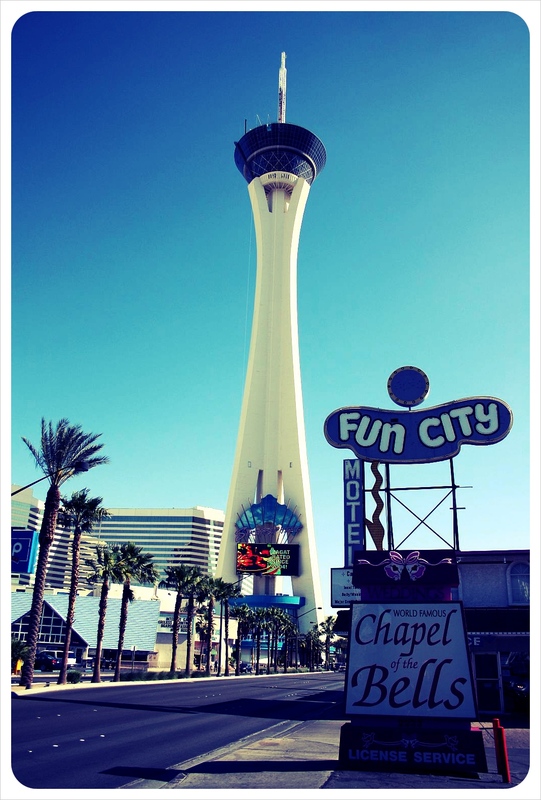 If that’s not enough of an adrenaline rush, you can now also jump off the tower with the Stratosphere’s latest thrill: the Vegas Skyjump. Vegas has always drawn the biggest stars of entertainment to have their own permanent show – there is something for everyone: comedy, cabaret, circus, burlesque, hypnosis, musicals… The biggest thing at the moment seems to be Cirque du Soleil, with currently 7 (!) different productions in Vegas. 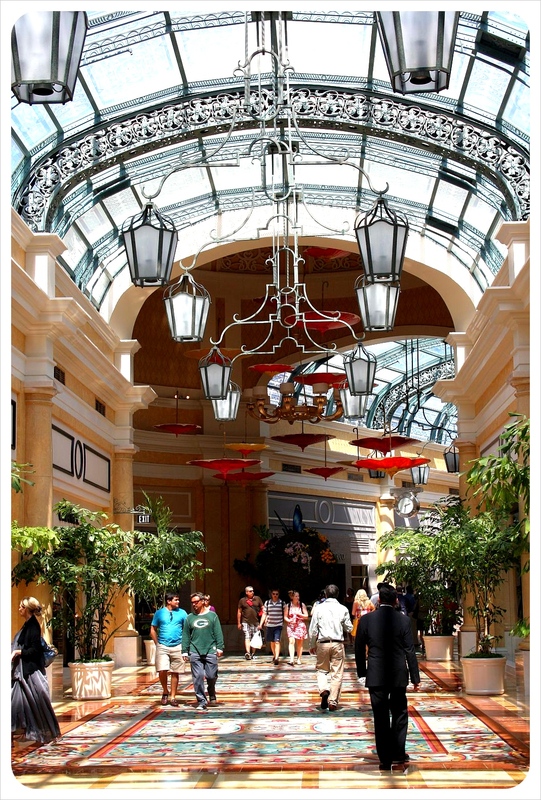 Located opposite the Wynn hotel, the Fashion Show Mall has more than 250 shops and restaurants – clothes, shoes, accessories, technology, books, etc – incl. stores like Macy’s, Bloomingdale’s, Sketchers, Abercrombie & Fitch, Mango, Apple, Levi’s, Nordstrom, Bath & Body Works. The more up-scale shoppers will find satisfaction in the long awaited newly-opened CityCenter which includes shops like Prada, Christian Dior, Bulgari, Carolina Herrera, Hermes, Roberto Cavalli, Cartier, Versace, Tom Ford, Miu Miu, Paul Smith and Porsche Design. 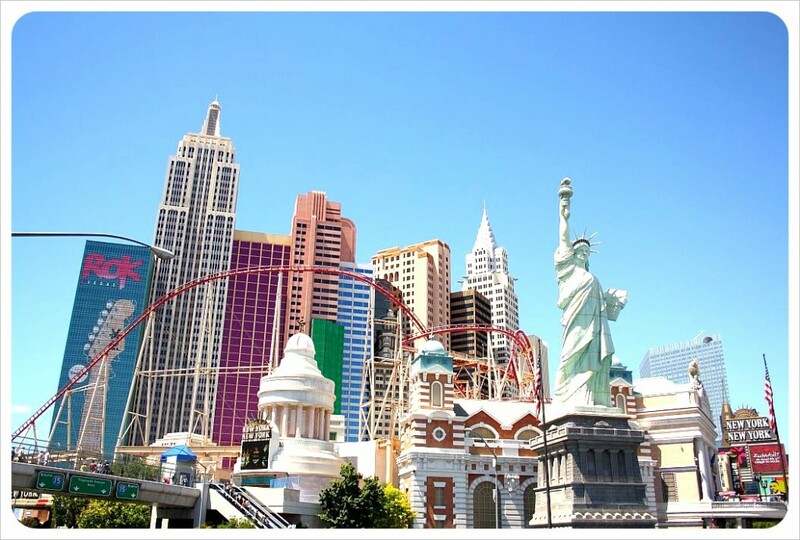 Red Rock Canyon, Hoover Dam or the Grand Canyon – check out our Las Vegas: Get Outta Town for more things to do outside of Sin City. Success in Las Vegas comes from rising to the challenge. As we mentioned above, the gambling girls we are not. Our challenge, our Everest if you will, was food-based. 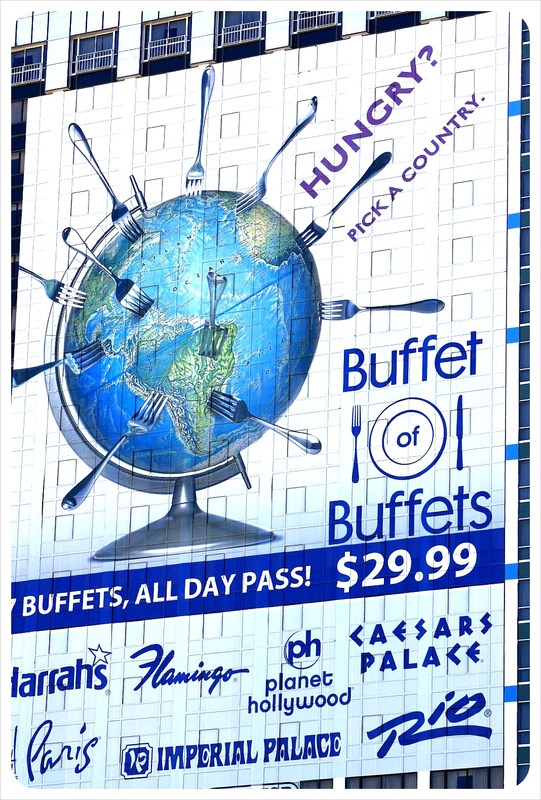 It was the Buffet of Buffets – a 24-hour pass to seven of the biggest and best gut-busting buffet in Vegas: Caesar’s Palace, Rio, Paris, Harrah’s, Planet Hollywood, Imperial Palace and Flamingo. While we may have taken the challenge very literally, (the Globetrotter Girls can proudly boast hitting 6 out of 7 buffets within 24 hours! ), instead of testing all 7 it might make more sense to try out 3 or 4 in the better hotels. At $54.99 (Jan ’15) the Buffet of the Buffets is still cheaper than even two buffets, would cost separately. 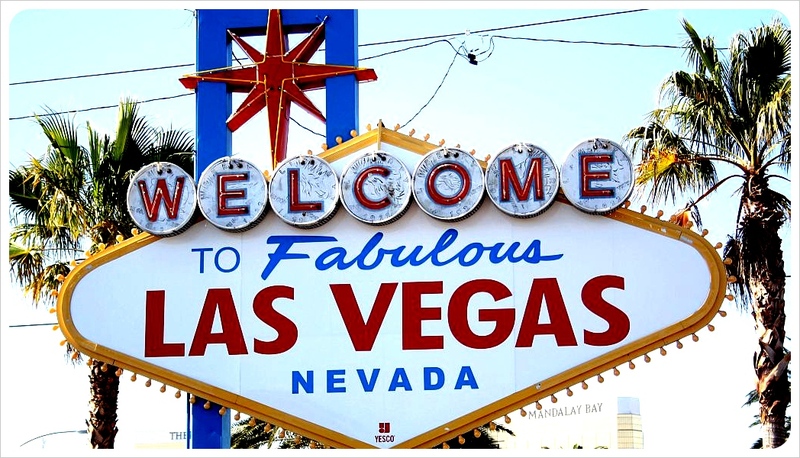 Skip the Flamingo and the Imperial Palace unless you want to do all seven to beat us :-). Go to Paris twice if you can, their buffet is by far the best of all. 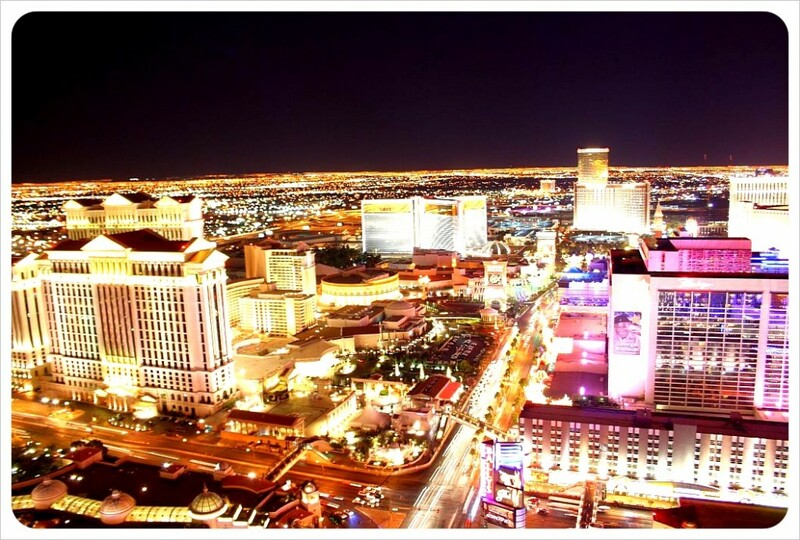 Looking for an inexpensive hotel in Vegas? 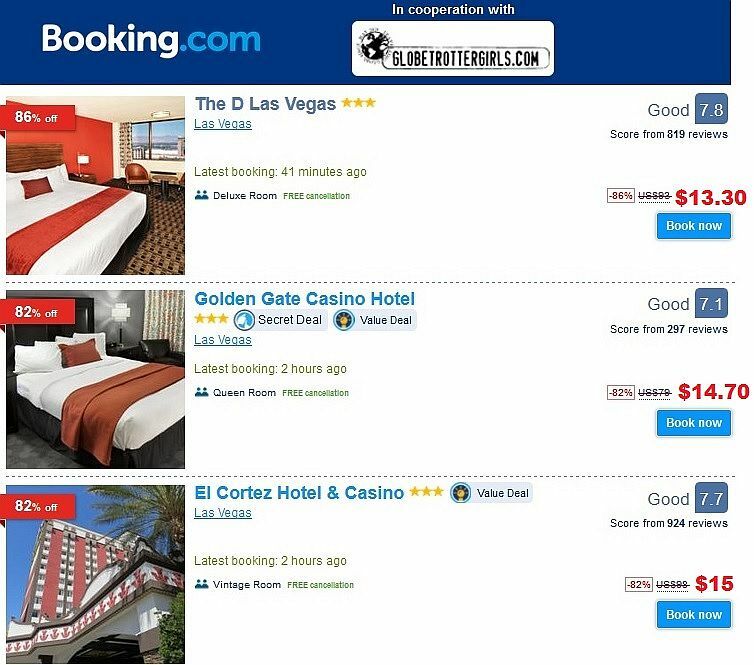 Check out Booking.com for their fantastic deals on Vegas hotels – both on and off the Strip!